To book: booking isn’t necessary but do arrive early! The advocates for vegan eating return to Savour for what is sure to be another energetic, fun and inspiring demo! Dave and Steve invent great-tasting, vegan products made from natural ingredients that are suitable for all lifestyles, and have concocted some clever plant-based alternatives to family favourites. Being busy dads they know how challenging it can be to juggle being a parent and making tasty healthy meals, and so their new book features over 100 delicious and easy vegan recipes with lots of options for economical, easy dinners that can be rustled up in 15 minutes. The guys will produce some of their new recipes from their third cookbook, the No.1 bestselling ‘Recipes for Happiness’ such as one-pot lasagne and chickpea tikka masala and will whip up some quick and easy veggie options that even the most voracious meat eater will enjoy. 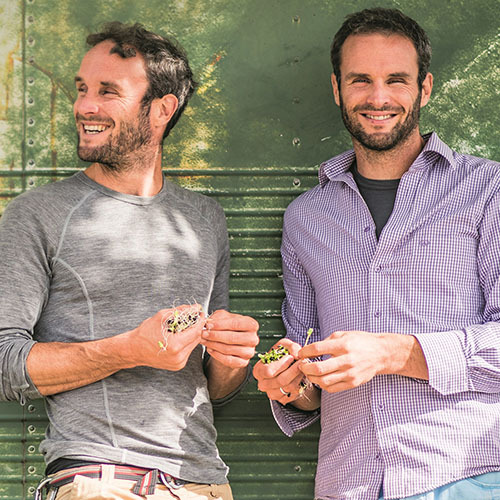 David and Stephen Flynn started The Happy Pear in Ireland in 2004 to help create a happier, healthier world, and to make healthy food and living accessible to everybody. Today they’re renowned wholefood and plant-based chefs, award-winning and bestselling authors, YouTube stars, and regular media contributors. The Happy Pear now employs around 170 people and it has grown into one of the most vibrant and renowned businesses on the Irish food scene, with several award-winning products. The business now comprises: three wholefood cafés/food stores; a sprout; a Happy Pear branded food manufacturing and distribution business; a coffee roastery; and a fermentation kitchen. Their first cookbook has sold over 100,000 copies and was on the Irish bestsellers list for three years running, their second cookbook was ‘Irish Cookbook of the Year 2017’ and their latest cookbook, Recipes for Happiness, is currently a No. 1 bestseller.